We have issued an updated research report on J.B. Hunt Transport Services, Inc. JBHT on Sep 10. Notably, shares of the company have fared well on a year-to-date basis. The stock has gained 10.9% compared with the industry’s rise of 7.8%. In second-quarter 2018, the Lowell, AR-based posted better-than-expected earnings and revenues. Earnings per share (EPS) of $1.37 beat the Zacks Consensus Estimate by 9 cents. The bottom line improved 55.7% year-over-year. Revenues came in at $2139 million, which outpaced the consensus estimate of $2045.1 million and increased 23.9% on a year-over-year basis. In fact, the company anticipates the top line to increase in the range of 11-15% in the current year primarily owing to impressive segmental performance. Moreover, the company’s business continues to be positively impacted by higher freight rates and strong shipping demand. A favorable pricing environment and reduced tax rates are additional advantages. Effective tax rate is estimated to decline to approximately 26% from 37.9% in 2017. Furthermore, we are also impressed by J.B. Hunt’s acquisition strategy aimed at growth. This strategy strengthens the company’s e-commerce delivery capabilities. In 2017, the company acquired Special Logistics Dedicated and its affiliated entities for $136 million. The transaction is expected to be accretive in the current year. Additionally, the company’s consistent efforts to reward shareholders in the form of dividend and buybacks raise optimism. In January 2018, J.B. Hunt raised quarterly dividend by 4.3% to 24 cents. On the buyback front, the company bought back 420,000 shares for approximately $50 million in the second quarter. As of Jun 30, 2018, the company had around $.471 million remaining under its share buyback program. J.B. Hunt also has an impressive VGM Score of A. Here, V stands for Value, G for Growth and M for Momentum and the score is a weighted combination of all three scores. 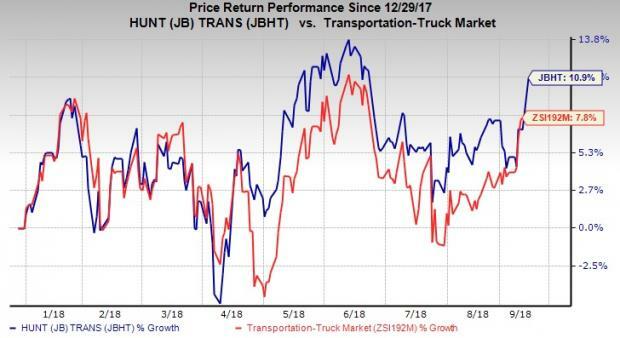 In light of these multiple tailwinds, we believe that J.B. Hunt should be retained by investors for now. The Zacks Rank #3 (Hold) carried by the stock seems to suggest the same. A few better-ranked stocks in the broader Transportation Sector are SkyWest, Inc. SKYW, Atlas Air Worldwide Holdings, Inc. AAWW and Old Dominion Freight Line, Inc. ODFL. While Atlas Air Worldwide and Old Dominion carry a Zacks Rank #2 (Buy), SkyWest sports a Zacks Rank #1 (Strong Buy). You can see the complete list of today’s Zacks #1 Rank stocks here. Shares of SkyWest, Atlas Air Worldwide and Old Dominion have gained 6%, 3.6% and 13.4% in the last six months, respectively.